Suffering a dog bite can be a traumatic event and result in a serious injury. 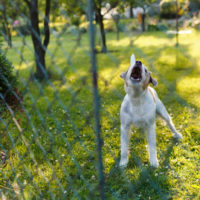 Some dog bites can result in an infection, tendon damage, nerve damage, or corrective surgery. If you or a loved one was bitten by a dog, you need to have as much information as possible to assess your legal rights. The state’s dog bite statute is codified in Ga. Code Ann. sec. 51-2-7. It states that when a “person who owns or keeps a vicious or dangerous animal of any kind and who, by careless management or by allowing the animal to go at liberty, causes injury to another person who does not provoke the injury by his own act may be liable in damages to the person so injured.” Basically, this means that if someone owns a dangerous animal and their carelessness allows that animal to bite you, the owner may be found liable. Obviously, not all dogs are considered “vicious” or “dangerous.” Nevertheless, there are certain breeds of dogs that are considered vicious categorically. Examples of vicious breeds include Bulldogs, Rottweilers, American Huskies, Wolf-dog hybrids, Sheepdogs, Terriers, Mastiffs, Great Danes, among others. the pet owner either carelessly managed the animal or allowed it to run around off a leash in violation of a local ordinance. The Georgia dog bite statute does not require a showing that the pet owner possessed knowledge of the dangerousness or viciousness of the animal if the animal was supposed to be on a leash (and wasn’t) when the bite occurred. The statute specifically states that “it shall be sufficient to show that the animal was required to be at heel or on a leash by an ordinance of a city, county, or consolidated government, and the said animal was at the time of the occurrence not at heel or on a leash.” Basically, this means that if the animal was off their leash and bites you, the owner could be held responsible. If you or a loved one suffered serious trauma from a dog bite, you need to speak to a lawyer sooner rather than later. The sooner you speak to an attorney, the sooner they can work on your potential case. Gillette Law, P.A., in Florida and Georgia, is experienced in representing victims injured in serious accidents, including dog bites. Contact us online, or call us at 904-358-1304 or toll-free at 888-366-5904. We offer a free initial consultation and work on a contingency fee basis, so you pay on a percentage basis only when we win your case.